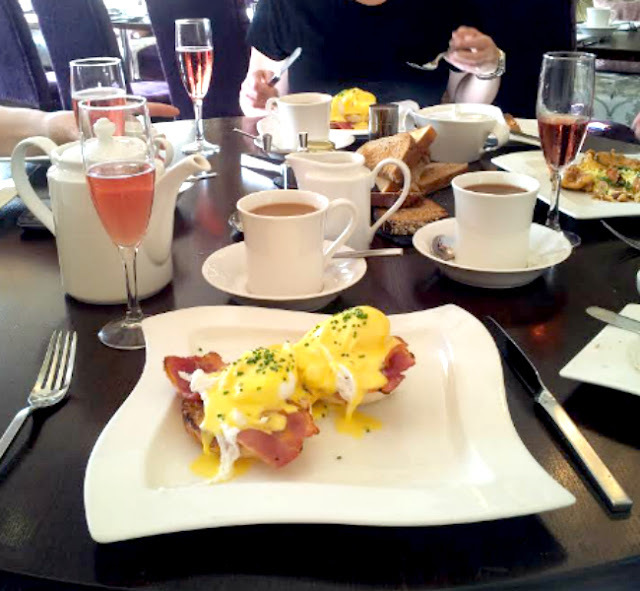 CherrySue, Doin' the Do: The Top 5 Irish Hotel Breakfasts Your Money Can Buy! 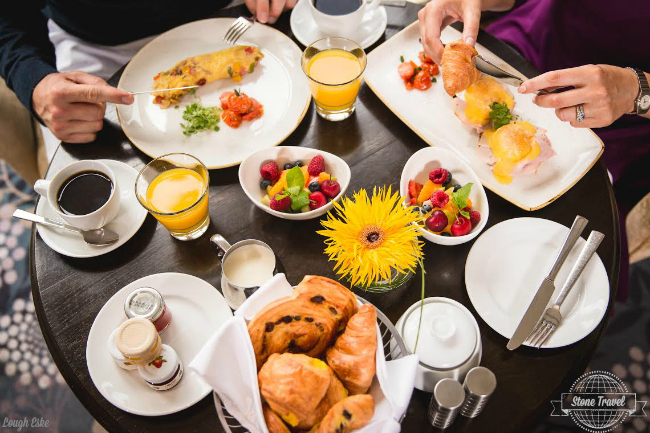 The Top 5 Irish Hotel Breakfasts Your Money Can Buy! Is it just me or are hotels not selling their breakfasts enough? Most websites you go to just give breakfast a cursory mention, the majority don’t even have pictures. Ditto the only time most guests give it a second thought is to find out whether or not it's included in their overnight rate. Not I. Over the course of the last year I’ve had upwards of 60 hotel breakfasts; some making me wish I was a Hobbit just so I could have second breakfast; some, well let’s just say not so good. Whether you’re up and out for an early business meeting in the locality, staying locally and looking for a tasty way to start the day or staying in these hotels themselves & considering skipping brekkie altogether, I’ve compiled a list of my top 5 mouth watering hotel breakfasts in Ireland so you won't miss out. Our most recent hotel stay was Jury’s Inn Cork as both Sue & I were speaking at the Irish Blogger Conference run by Cool Events. As we had a few drinks after the conference with some lovely ladies my first priority the next morning was cold water. Imagine my utter joy at seeing a huge dispenser full of icy water infused with lemon, lime & mint! 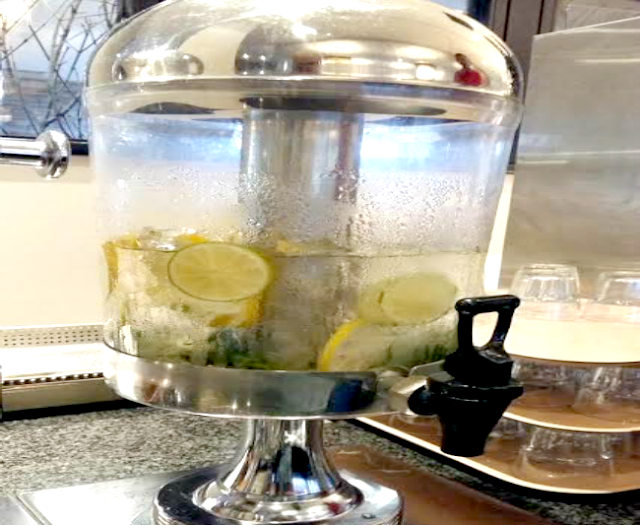 Note to ever hotel ever: Do this! After a couple of glasses of uisce restored our equilibrium, we indulged in a freshly toasted bagel with cream cheese and bacon followed by a bowel of fresh fruit. There was a huge variety of hot and cold breakfast items. I really liked that they had take away cups and lids available at the coffee machines so you can take a coffee with you for your journey. It's little touches like that that really set a brekkie offering apart. Breakfast is served in the Restaurant midweek 6:45am-10am weekend’s & public holidays 7am-11am priced at €10 per person. If you’ve read any of my travel posts you’ve probably noticed I have a serious grá for Eggs Benedict. Two hotels in my opinion share the top spot for the most perfect Eggs Benedict and the Dylan is one of them. Especially if you do as we did & have a glass of champagne or a fresh Mimosa to wash it down. We've been lucky enough to stay in The Dylan for several events, as a 5 star Boutique Hotel it truly is a gem in Dublin's crown; as an eatery in it's own right it's way up there too. I've recommended The Dylan to people looking for a stay with a difference around Dublin 4 more times than I care to recall and The Tavern is a big deciding factor in that. Breakfast is served in the Tavern Restaurant, buffet for €21 or a la carte €25 per person. A budget friendly version is available in the bar where a full Irish will set you back €10.50 or my favourite Eggs Benedict €8.50. The restaurant and head chef in Killashee have won many awards and it's not hard to see why. After The Dylan, The Killashee holds my top spot for Eggs Benedict and that's high praise indeed. Everything about the way they prepare and present this dish is pure perfection. My mouth is watering just writing this remembering how good it was. My son absolutely loved the sausages and he ate 4. I’ve never seen him eat so many so I had a taste too and had to agree with him, they were delicious. I love when a hotel sources not only local produce but top quality local produce. Breakfast is served in Turners Restaurant Monday–Friday 7am-11am Saturday & Sunday 8am-11am, continental breakfast €10.95 or full Irish €16.50 per person. 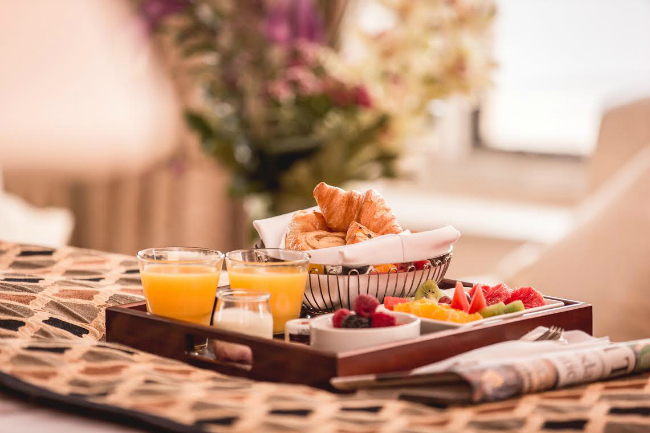 Every morsel of food served for breakfast at Brooks is fresher than fresh and sourced from the finest local producers. Breakfast is one of the best spreads I’ve seen in a hotel. Oodles of fresh compote, mouthwatering fruit, artisan breads, cheeses, cold meats, cereals & pastries all served buffet style. With lots of options on the breakfast menu too, there’s something to suit everyone’s taste. It follows that head chef Patrick McLarnon has won more awards than many in his field. Hands down the best breakfast we've had in Ireland, if not world over was in Lough Eske Castle. Everything here was top notch, the food, the setting and the staff. 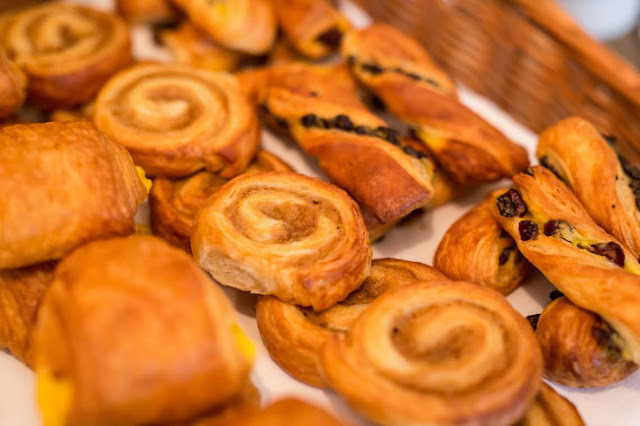 It’s so hard to choose what to eat from the vast array of fresh fruit, pastries, artisan breads and meats; not forgetting the full Irish. They even have a Chef on hand in the restaurant to whip up an omelette of your choosing right before your eyes. The staff were truly amazing, as one lady was refilling the fresh fruit she kept giving my son more & more grapes as she passed our table. He thought it was great fun & promptly scoffed them all! The Chef didn’t blink an eye when my daughter took a little time to choose what she’d like on her crepe that he made for her. I don’t blame her with oodles of delicious sweet toppings I’d take my time too. The Chef even came to our table to make sure the children didn’t want a second crepe before he finished. On point service Lough Eske. 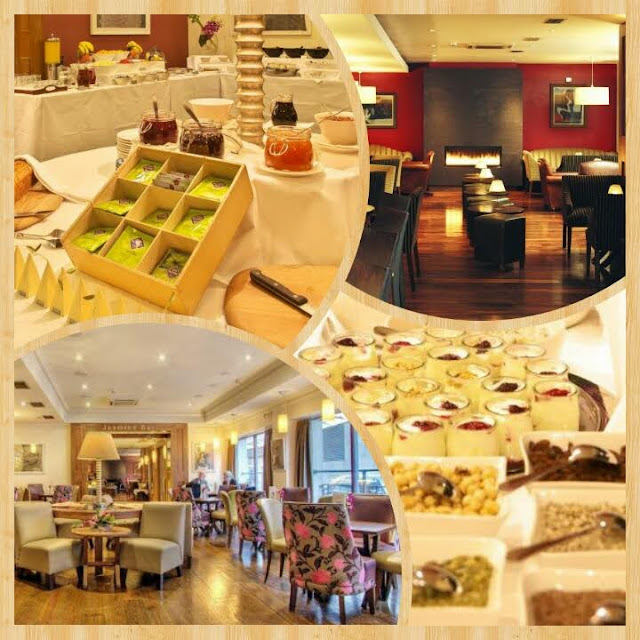 Breakfast is served in Cedars Grill between 7am – 11am, continental breakfast €12 or full Irish €22 per person. Have you been to a hotel that serves top notch brekkie? Let us know so we can go!